The EcoSociety is happy to announce that it is teaming up with the Wild Postcard Project to promote British Columbia’s incredible biodiversity! 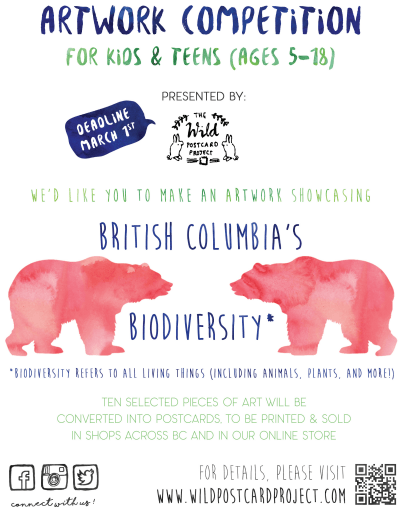 The Wild Postcard Project (WPP) would like to invite kids and teens (ages 5-18) to participate in a new initiative hoping to raise awareness of BC’s biodiversity through an artwork competition. Biodiversity is all living things in nature, such as animals, plants, and micro-organisms that comprise all life here in BC! We are calling on BC’s talented youth to make artwork depicting BC’s biodiversity. We will have a jury select the top 12 pieces of art, which we will convert into postcards. Doing so, we hope, will share BC’s biodiversity as depicted by our artistically-inclined youth to all corners of the globe, as well as help BC kids and teens engage and better understand the vastness of BC’s biodiversity. Additional details may be found on our website: wildpostcardproject.com. Here, we also provide a resource where kids and teens can discover and learn about BC’s biodiversity. WHO: The competition is open to kids and teens (ages 5-18) who are currently living in BC. WHAT: Your artwork (whether you paint, draw, etch, screen print, etc.) must represent BC biodiversity in some way. Entries must be created on size A4 paper or smaller. Please also complete and include the competition entry form. WHEN: Postmarked no later than March 1th.